A few months ago I was in France at the grocery store when I came across a little package of flageolet beans that were so white and cute, I bought them without the faintest idea of what I’d do with them. Honestly, I expected them to end up in a craft of some kind, but then again I’m not very crafty so it doesn’t totally surprise me that I cooked them. I’ll rarely post recipes on here, but this one is so good I just can’t help it. 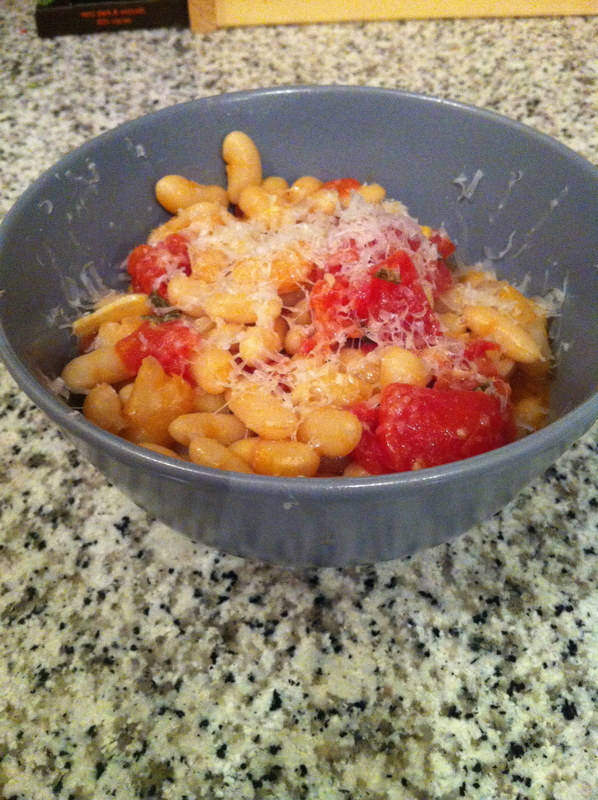 I was thumbing through a favorite cookbook of mine, The Best Italian Classics (an America’s Test Kitchen cookbook) and happened to come across a recipe that called for white beans, tomatoes, garlic and sage. Since there happened to be a giant sage bush in my backyard, garlic and tomatoes in my kitchen, and time on my hands, I decided to give it a try. It pretty much blew my mind. I’m not a cooker of beans, and I’m rarely an eater of beans, but now I’m happily both. I’ve made this twice and my husband, who grew up eating beans, loves this dish. I hope you consider making it sometime soon! 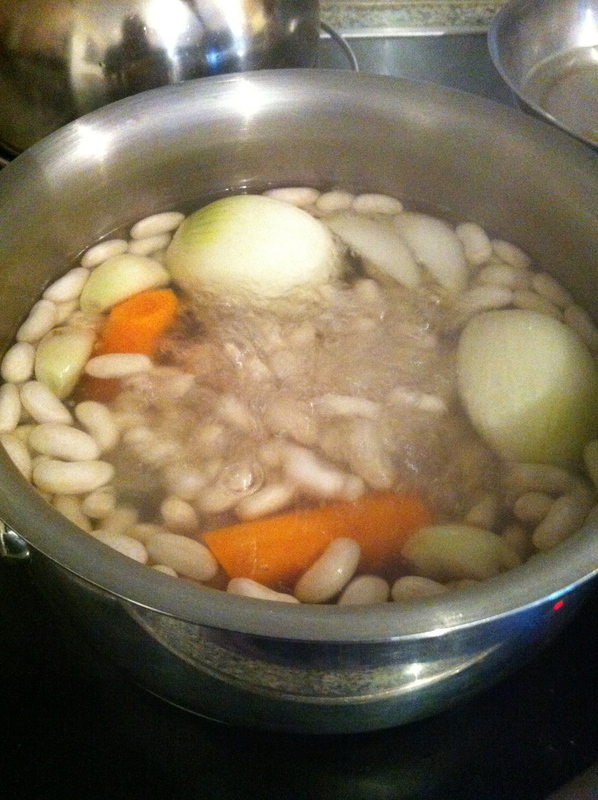 Remove the pot from the heat, completely cover, and let stand until the beans are fully tender, 30 to 60 minutes. I tested mine every 10 minutes to check their done-ness. 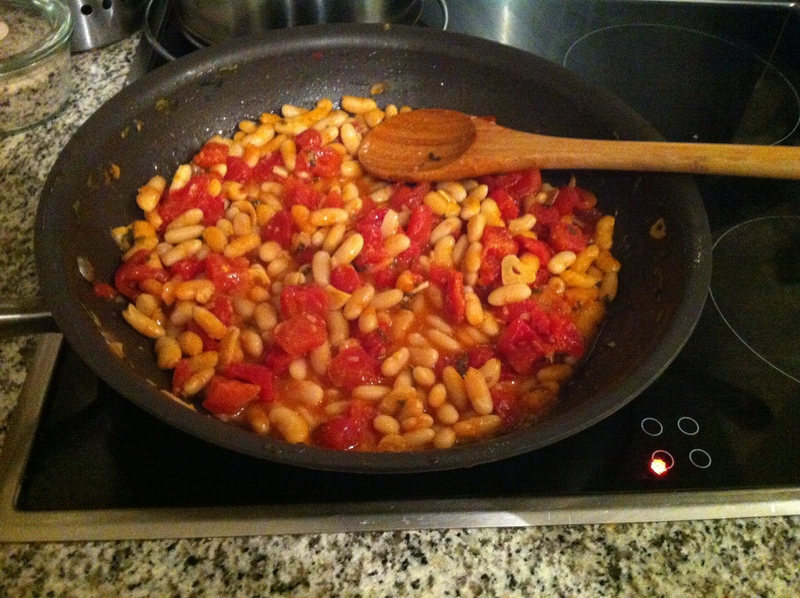 When you’re happy with the texture, drain the beans, reserving 1 cup cooking liquid. Remove and discard the onion, carrot, and bay leaves. With a slotted spoon, transfer the head of garlic to a cutting board. Squeeze the cloves out of the skins and return the softened cloves to the pot with the beans. Heat the olive oil in a skillet over medium heat, and add the thinly sliced garlic and sage to it and as it starts to sizzle, shake the pan a little so the garlic doesn’t stick. Apparently, using a spoon to stir the garlic will just cause the garlic to clump. We can’t have clumpy garlic. Once the garlic is pale gold and the sage is dark in color, add the drained tomatoes and ½ teaspoon of salt and simmer until the tomato juices have evaporated and the tomatoes look shiny, about 10 minutes. Now here is where it all comes together – stir in the beans and reserved cooking liquid. The softened garlic cloves just melt into the sauce. Simmer, stirring occasionally, until the liquid has evaporated, about 20 minutes. Off the heat, stir in the parsley (if you have it), and season with salt and pepper to taste. Or, you can do what I did, and add a little freshly grated Parmesan cheese instead of adding more salt. Serve it immediately in cute little bowls, accompanied by extra-virgin olive oil for drizzling at the table. And voilà! I turned my French beans into an Italian classic. ← WE WENT TO PORTO FOR THE WEEKEND, YOU SHOULD TOO!